The speed option can first be seen having an effect on level 2 with the movement of the ice flows. Long version has basic Demo Play, short version removed it. Death to the death chime! Get ready for the winter (northern hemisphere). 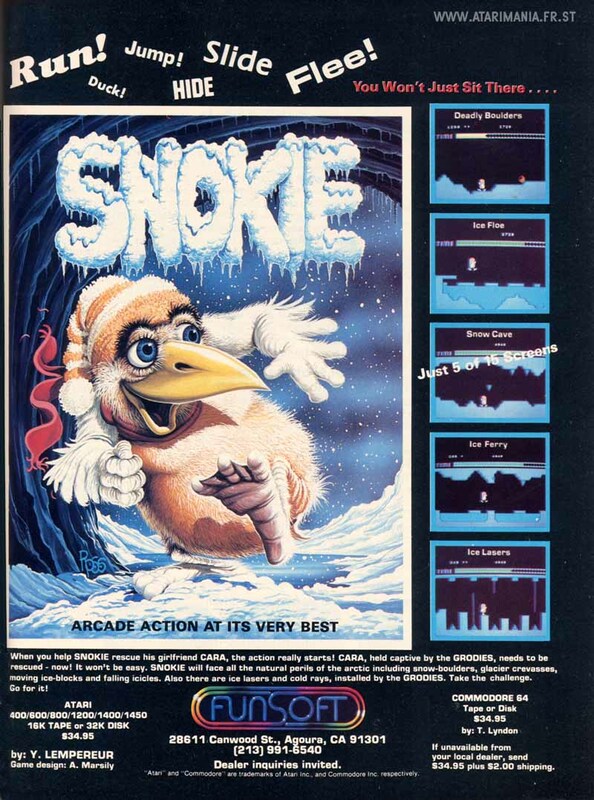 This Snokie download is (presently) the long version 17K DOS file, and like a lot of games at just over 16K, they made a short version just under 16K for 16K RAM machines like in the ad here but also usually to demonstrate a cartridge could be made. Short version eliminated the custom font, the top ten high scores, and emilinated the death chime which is annoying anyway. CHEAT MODE unlimited lives, for this file 17461 bytes. Change one byte at offset $2E73 from $A5 to $60. Affects both one and two players. This was one of my favorite games. Wow it's been so long and I'm going to play it again. 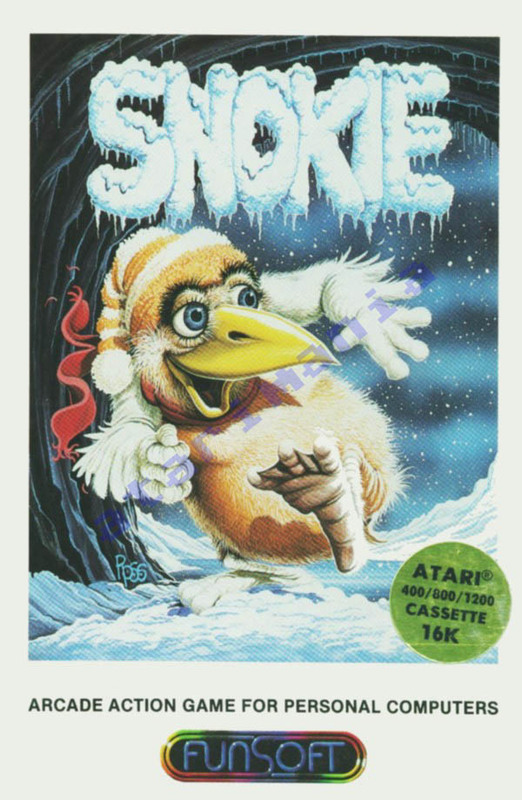 I think this may have been the very first Atari 800 game I ever saw. It was enchanting, beautiful, and challenging. 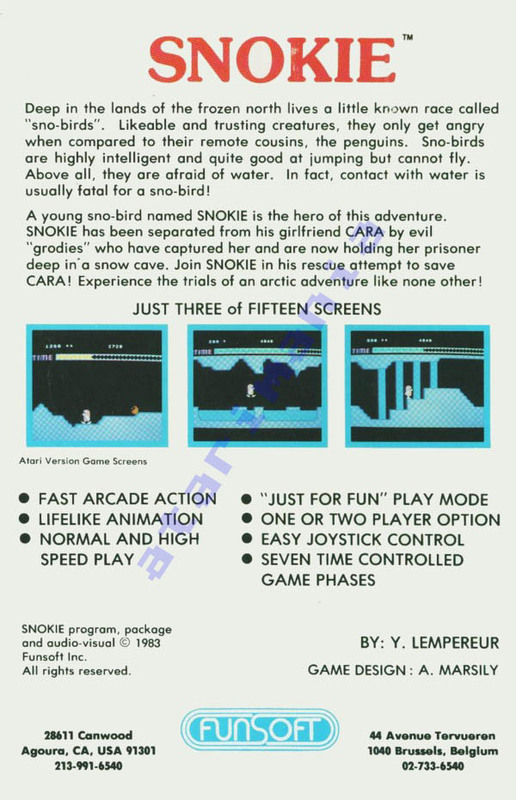 Snokie demonstrates that Super Mario Bros (1985) didn't fully create the scrolling platformer by itself. There were a lot of earlier video games that paved the way, and they should be remembered. A tricky side scroller, you have to be really careful if you want to make it very far. Nothing special sound or graphics wise, but a good gaming challenge. Not a bad little side-scroller. Also try his other game, FLAK. Also released without authorization as Swash.